There’s no denying it. Creating the perfect outdoor kitchen starts with choosing the right grill. A top-of-the-line grill from Capital Precision, Lynx, Weber or Traeger does more than just cook perfect steaks, chicken, fish, ribs and vegetables. It’s a statement piece that shows you take your barbecuing seriously. The debate of charcoal vs. gas will never die out. Purists argue that gas grills don’t provide the same flavor as charcoal or wood-fired grills. But nothing competes with the versatility and speed you get when cooking with propane gas. Remember that the best grill is the one you use. Be honest, would you rather spend your time tending to finicky charcoal briquettes or enjoying delicious food cooked quickly on your gas grill? Leave the fragile materials indoors. 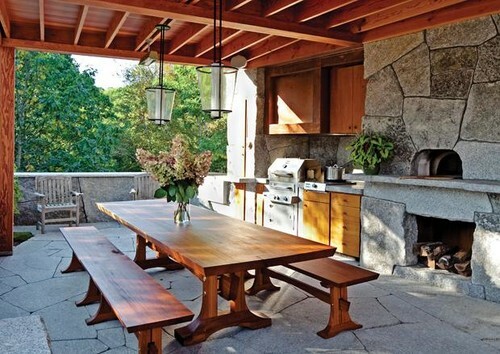 Outdoor kitchens need to be tough and withstand the test of time. 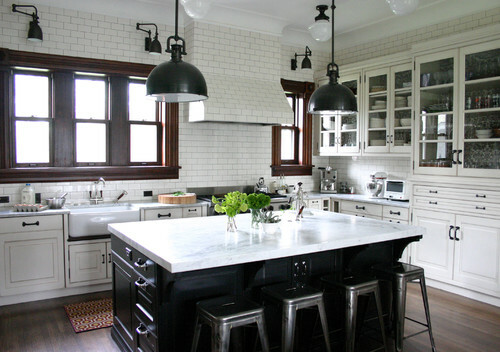 Quartz and granite countertops are great for a modern and low-maintenance look. Want something eco-friendly? Consider recycled glass, which can be mixed with concrete to create a unique and contemporary style. Tiles are a great choice too. What they may lack in durability they make up for in versatility and variety. And remember that a chipped tile can be easily repaired or replaced. Whether you’re making s’mores with the kids or extending an evening dinner party into the wee hours with a glass of good wine, open fires have a romance and charm that can’t be matched. 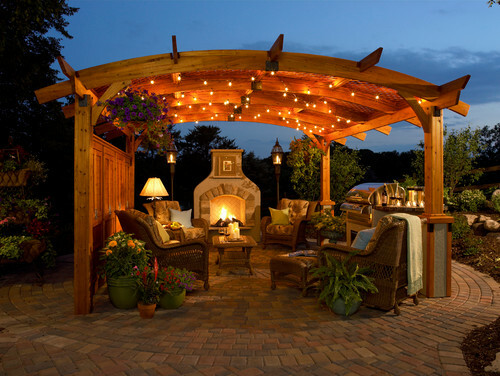 If your space allows it, consider making a fireplace or fire pit part of your outdoor kitchen. It’s warm, cozy and inviting. A late afternoon thunderstorm can put a damper on any cookout. But you can be prepared. If your outdoor kitchen can be built under a permanent awning or portico, perfect! If not, consider investing in a temporary awning over the cooking area and extra-large outdoor umbrellas to keep your guests dry while they eat. When it comes to temperature control, nothing’s more effective than standalone fans and heaters. Move them around to where they’re needed most. And don’t skimp! You don’t want your guests huddled around a single heater. Nearby hedges, trees and fences work best to keep the wind at bay. 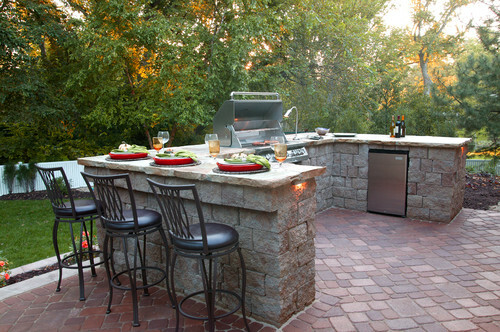 Build your outdoor kitchen to take advantage of your existing landscape. Just because you’re cooking outdoors doesn’t mean you have to leave the creature comforts inside. A deep farmhouse sink can hold the dishes from an entire cookout. Who wants to take a break to wash up halfway through a party? Consider a compact refrigerator instead of larger combination refrigerator and freezer. Use the space you save to install an insulated ice bin or wine cooler. Think about what you’ll be cooking most. A dedicated ice cream maker can be a real treat for both kids and adults. Have a fisherman in the family? A deep fryer is perfect for making hushpuppies and frying up the catch of the day. Don’t let the evening end early because there’s not enough light. LEDs, called the Better Bulb by Consumers Digest, run cool, are long lasting and come in an ever expanding variety of colors and styles. Some LED bulbs can be controlled with a remote or even your iPhone! Natural light sources have their place, too. Citronella candles, for example, not only provide a bit of light, but their pleasing smell can repel mosquitoes! Now You Just Need the Food! With a great grill, durable countertops and tiles, a comfortable atmosphere and top-notch appliances, you’re on your way to creating the perfect outdoor kitchen. All that’s left? Deciding what you want to cook first. Here’s a few of my favorite outdoor party recipes to get you started. 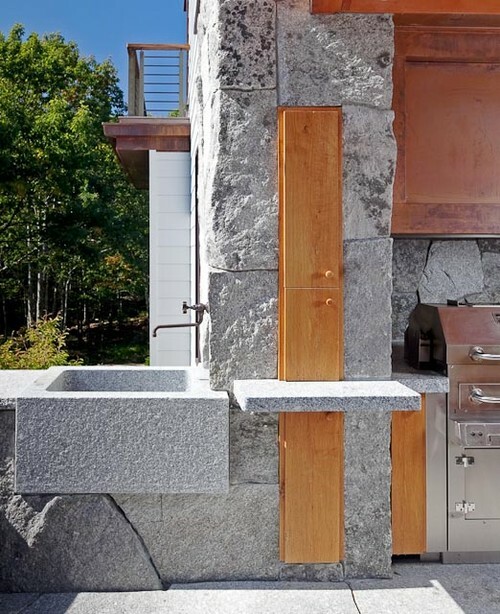 Want help creating your the outdoor kitchen of your dreams? Give us a call at (727) 846-9249 or send us a message!